I really rushed through the preparation of this meal tonight, but it turned out very well. I had originally thought I wouldn’t have time to cook after getting home from a performance which was a part of the Sixth Annual Avant Music Festival (a terrific evening of music by Paula Matthusen) but when I learned that the length of the program was to be only about 70 minutes, I went out and bought seafood at the Greenmarket today. As it turned out, the music began late (it had been sold out early, but there was some late seating, and I think everyone who showed up may have made it in), and even though one of Matthusen’s pieces had to be pulled because of a musician’s illness, we didn’t get out until pretty close to 10 o’clock. Also, on the way home, we had some sorta-bad subway karma. This meant there would be no time for any fanciness in the kitchen, or much thinking about choice of ingredients or cooking details. 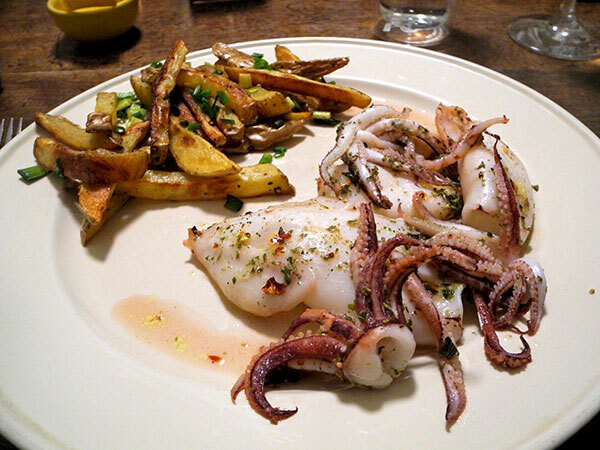 What I ended up putting on the table was a simple meal, its elements very familiar to us, of spicy roasted baby squid, and a reasonable approximation of frites, which were in this case baked and finished with two different forms of allium. The squid recipe is the absolutely wonderful creation of Rose Gray and the late Ruth Rogers, from their, “Italian Easy: Recipes from the London River Cafe“. I highly recommend the recipe and the book, as well as their “The River Cafe Cook Book” and “Italian Two Easy, Simple Recipes from the London River Café”. Each of them is a jewel, and together they could serve very well as a complete kitchen library. The cephalopods would have taken only 10 minutes from start to finish, but, after I had rinsed them I set them out to come to room temperature, they had to wait for the potatoes, which probably took all of 45 minutes. Note to self: You have permission to reproduce this meal any time you want to. 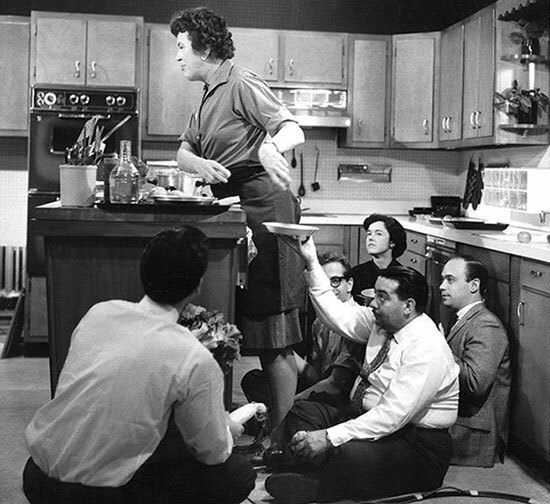 I was once on fairly intimate terms with Julia child (I mean the books, not Julia herself, or even her TV show, because I lived in Providence and Newport, not Boston, and I didn’t watch much television of any kind, and I certainly wasn’t about to do so in the 70s). I did prize her first two books however, and I still have them, the spine of the older one lovingly repaired with white duct tape. Among my campaign medals I count the fact that I had managed to bring to the table each of her three variations on the French preparation of tournedos, some more than once. Okay, I confess that like everyone else in the country almost half a century back, I actually did watch some of ‘The French Chef’. The picture below is my favorite Julia image. 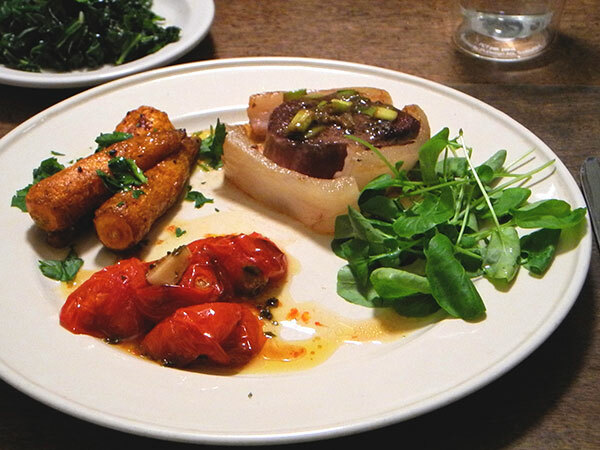 Until this week I hadn’t really thought of tournedos since the 1970s, and I probably would not have found myself there tonight, except for the fact that I had almost tripped over a pair of five-ounce filets at the Millport Dairy stall earlier this week. Everything I’ve purchased from John has been exceptionally good; I expected nothing less of his beef, and the two vacuum packages looked like they might have been made for me/us. I had no mushrooms, no artichoke hearts, and no foie gras or truffles on hand, so I went with a slight modification of Julia’s basic steak au poivre, which she allows as an alternative to the more elaborate preparations. It was delicious. 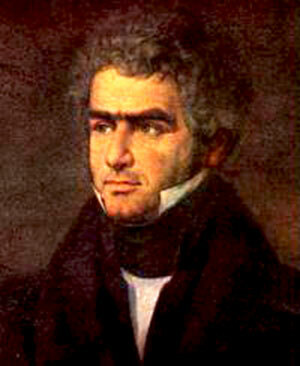 The steaks were of the classic size, about 2 1/2 inches in diameter, and about an inch thick,. They looked much more impressive once I had encircled their extraordinary leaness in pork fat, but that took some doing. Just as I was about to perform the operation I noticed for the first time that the Niman Ranch fat I had chosen to use was salt pork, which wouldn’t do at all. I scurried about a bit and succeeded in boiling the pork strips, neutralizing most of the salt, but then I found the segments weren’t going to cooperate in encircling the filets. I pulled out my jar of toothpicks and, with the help of good kitchen twine, finally succeeded in taming the now not-so-salty pork. 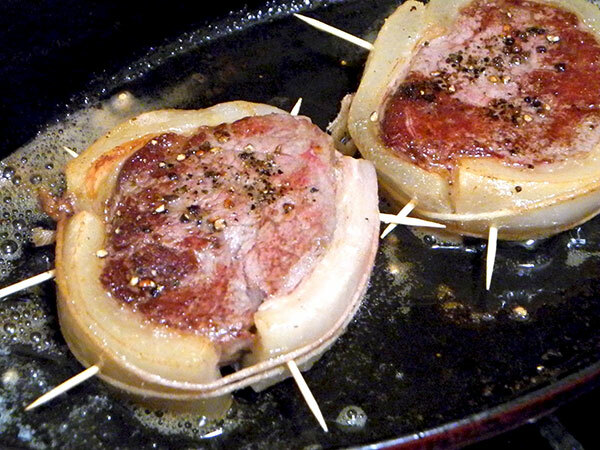 My tournedos now looked like mines, but they were going to keep their shape and retain their juices. Note to self: Despite the circumstances of its genesis, this meal was very, very good. Having been reminded yesterday that there probably wouldn’t be be time to put meals together on three of the next six nights (because of performances which would get us home pretty late), I made a list of the more perishable vegetables I had on hand, determined not to lose any of them to advancing age. The list included upland cress; leeks, both regular and baby; spinach; spring, or green garlic; cherry tomatoes; kale, and most of my fresh herbs. Last night, after a certain amount of on-line research and mental juggling, I managed to assemble a meal which put a good dent in those stores. I had been concerned that my ‘expiration date’ priorities might compromise the best prescription for the beautiful 12-ounce tilefish fillet I had brought home from the Greenmarket earlier in the day, but, as it turned out, I needn’t have worried: The entire entrée was a small triumph, thanks to the suppliers, the internet and two recipes which were totally new to me. 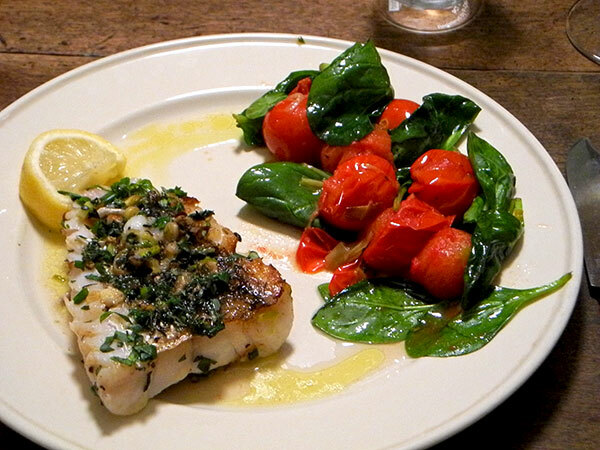 Together, Melissa Clark’s, ‘Pan-Seared Tilefish with Garlic, Herbs and Lemon‘, and Mary Ann Esposito’s, ‘Cherry Tomatoes with Leeks and Thyme [Pomodorini con Porri e Timo]’, seemed to have been created with both my situation and my particular tastes in mind. Using them in combination, I was able to use at least some of the two forms of leek, most of the tomatoes, a good portion of the herbs, two of the three pieces of spring garlic, and all of the spinach I had painstakingly separated from those leaves which had not quite made it while waiting a few days to be used. My only innovations were the addition of spinach to the leek-and-tomato dish, the very generous amount of herbs I lavished on the tilefish, and my decision to not remove its skin. 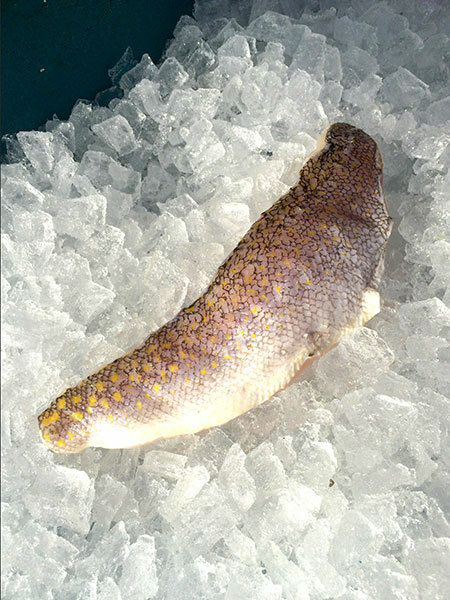 I had never heard of the tilefish (the species in our waters is Lopholatilus Chamaeleonticeps, aka Great Northern Tilefish, Golden Tilefish, etc.) until six or seven years ago, but I’ve been delighted with it both times I’ve cooked it. 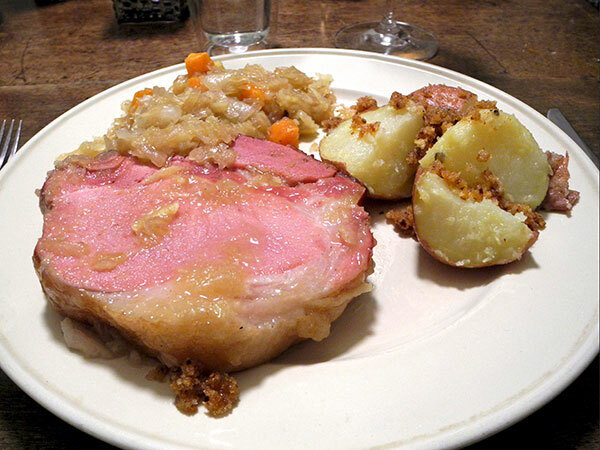 I roasted it each time, first with a lot of butter and fresh breadcrumbs, later on a bed of leeks and bacon pieces. Yesterday I sautéed it, and baby leaks and herbs were pretty front and center this time. Looking forward, tonight we will enjoy two small filet mignon the Greenmarket’s from Millport Dairy, which will open up a number of possibilities for using the perishable vegetables and herbs which remain. I’m hoping I’ll be able to squeeze in at least one root as well. This was a very German meal which warmed the kitchen, the breakfast room, and a pair of interested diners on a cold February night. I was thinking that it was Tuesday night that would bring single-digit temperatures, and then mid-evening tonight I suddenly learned that the temperature outside was 8º. I thought that I wasn’t prepared for a dish fully appropriate to that kind of environmental challenge, but it turned out I was wrong. This Mark Bittman recipe which I think I had torn out of the New York Times sixteen years ago was more than up to the challenge of a cold night, although, to tell the truth, the apartment remained warm, and there wasn’t even any chilling howl of wind to be heard. 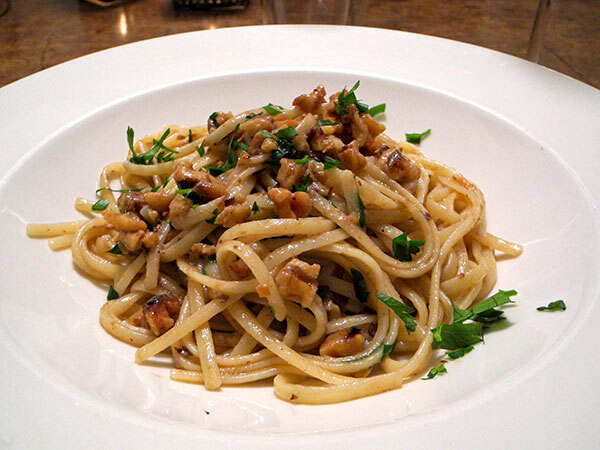 By the way, Bittman’s linguine and walnut recipe remains my favorite version for that pairing, and there are certainly many of them. Still on schedule: Tomorrow will still be a Kasseler Ripchen-und-sauerkraut day, even if the evening temperature reading is supposed to be a balmy 20-something Fahrenheit. 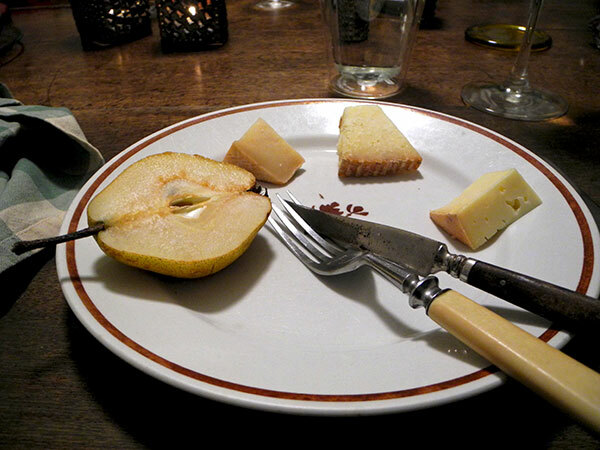 Dessert was a plate of three cheeses (L-R in the picture below), Manchester goat cheese from Consider Bardwell, Frère Fumant sheep cheese from 3-Corner Field Farm, and Twig farm (Vermont) washed rind goat cheese from Eataly,), with an Anjou pear from Locust Grove Orchards.